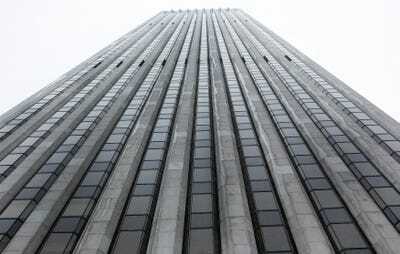 REUTERS/Shannon StapletonThe General Motors building is seen in New York March 8, 2013. “The Liar’s Ball: The Extraordinary Saga of How One Building Broke the World’s Toughest Tycoons” By Vicky Ward. Wiley; 240 pages. THE property business, goes an industry proverb, is “a circle of men holding a revolver to each other’s heads”. And, all too often, to their own, as Vicky Ward illustrates in her colourful history of America’s most fought-over office block: the 50-floor General Motors Building on Fifth Avenue in Manhattan. Built for the carmaker’s bosses in the mid-1960s–when what was good for the company was said to be good for America–the white-marble tower was never New York’s tallest or most beautiful skyscraper. But something about it drove the property tycoons nuts. Ms Ward, whose breakthrough book was “The Devil’s Casino”, about the fall of Lehman Brothers, has fun with the obsessive, hubristic cast of characters who have scrapped over the building (though the scene is at times too crowded with names and personal details). Among them are Donald Trump, the industry’s master of self-promotion, who was the first to push rents over the magic figure of $US100 per square foot; Disque Deane, a uniquely unpleasant financier who broke bottles over heads and divorced his wife in Bermuda to avoid having to pay her a fair share of his wealth; and Cecilia Benattar, the “housewife tycoon”, who was so wrapped up in dealmaking that it took her six months to name her first child. As they hustle, in some cases taking on vast debts to secure the prize (you can’t buy a $US50m building until you first find $US5,000, according to another industry joke), these bigwigs do plenty of dangerous gambling, double-crossing and, of course, suing. The most financially reckless of them all was Harry Macklowe, a local developer who, after many years of trying, got his hands on the block in 2003 for a record $US1.4 billion, only to lose it five years later because he had posted it as collateral for loans for the spectacularly ill-advised purchase of seven other buildings. One of Mr Macklowe’s better decisions was to sign a deal with Apple. Its flagship store, located under a giant glass cube in the plaza, attracts hundreds of thousands of visitors a year. Today the skyscraper is associated more with mobile devices than with motor vehicles. Owned by a rival developer and Chinese and Brazilian interests, it is worth more than twice what Mr Macklowe paid for it a decade ago.